Perhaps you've seen James and Betty Robison begging for money for the poor, showing children searching in Cambodian garbage dumps for anything to make their life better. 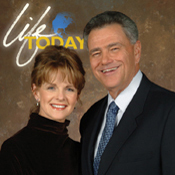 The show is Life Today, as seen on TBN. The appeal is heart-wrenching, and the needs are real; BUT, where does all those contributions, fifty million a year, go? Well, James Robison doesn't think it's any of your business, so he refuses to disclose complete financial information to the Better business Bureau. Hypocritically, Robison claims on his website, "LIFE Outreach International maintains a high standard of financial responsibility and accountability." To the contrary, LIFE Outreach International Association of Churches (LOI) FAILS to meet three of the BBB's Standards for Charity Accountability. Affiliates: Life for Children, Zoe Aviation and Charter Service. Stated Purpose: "to share the life and love of Jesus Christ with hurting people worldwide by means of personal ministry, media outreach and humanitarian mission relief." LIFE Outreach International Association of Churches (LOI) does not meet the following 3 Standards for Charity Accountability. Standard 12 : Detailed Functional Breakdown of Expenses - Include in the financial statements a breakdown of expenses (e.g., salaries, travel, postage, etc.) that shows what portion of these expenses was allocated to program, fund raising, and administrative activities. If the charity has more than one major program category, the schedule should provide a breakdown for each category. LOI does not meet this Standard because the detailed functional breakdown of expenses within the organization's financial statements did not include a detailed breakdown of expenses for each of its major program activities (i.e. media ministries, missions outreach, and literature and tape distribution). Standard 16 : Annual Report - Have an annual report available to all, on request, that includes: (a) the organization's mission statement, (b) a summary of the past year's program service accomplishments, (c) a roster of the officers and members of the board of directors, (d) financial information that includes (i) total income in the past fiscal year, (ii) expenses in the same program, fund raising and administrative categories as in the financial statements, and (iii) ending net assets. LOI does not meet this Standard because it did not provide a copy of an annual report. Standard 17 : Web Site Disclosures - Include on any charity websites that solicit contributions, the same information that is recommended for annual reports, as well as the mailing address of the charity and electronic access to its most recent IRS Form 990. LOI does not meet this Standard because its website, www.lifetoday.org, does not include all of the recommended information for those charity websites that solicit for donations. Specifically, it does not include a board roster or financial information. In addition, the BBB Wise Giving Alliance requested but did not receive complete information on the organization’s governance and oversight, effectiveness measures, finances, solicitation materials, donor privacy, and fundraising disclosures and is unable to verify the organization's compliance with the following 15 Standards for Charity Accountability: 1, 2, 3, 4, 5, 6, 7, 8, 9, 13, 14, 15, 18, 19, and 20. LIFE Outreach International Association of Churches (LOI) meets the remaining 2 Standards for Charity Accountability. *Compensation information was not provided. Please understand that I don't condemn anyone, for the Bible condemns all of us as guilty, dirty, rotten, hell-deserving sinners. My salvation solely rests in Christ's righteousness, because of the precious blood that He gave for our sins. My intention is not to be unkind; but rather, to expose the greedy televangelists who exploit Christianity to make money.